Tourists visiting Egypt in June declined 20.5 percent compared to the same period the year prior, according to the latest report by the Ministry of Tourism. A total of 785,652 foreign tourists spent 6.8 million nights in Egypt during June compared to 988,573 spending almost eight million nights a year earlier. The report also showed that the first half of 2014 brought 4.4 million tourists to Egypt, a 25 percent drop from the same period the previous year. From January to June, most tourists came from Europe, with 3.4 million Europeans spending 32 million nights in Egypt. The Middle East was the second biggest region for tourists to Egypt, with almost 570,000 visitors from the region, representing a 42.5 percent drop from the same period the previous year. 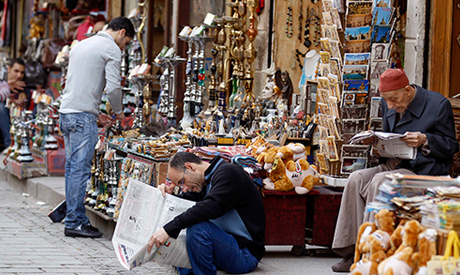 Middle East tourists account for 7.7 million nights in the first half of 2014. The tourism sector, which accounts for roughly nine percent of GDP, has received several blows since a popular uprising forced president Hosni Mubarak to step down in 2011. Prolonged periods of unrest and sporadic violence have led many countries to warn their citizens against travelling to Egypt. Nonetheless, several countries have recently lifted travel warnings on Egypt's South Sinai resorts following the relative stabilisation brought to the security situation in the area, revealed Minister of Tourism Hisham Zaazou earlier this month. Several European countries imposed Egypt travel bans since February, when a bomb blast on a tour bus in South Sinai killed three South Koreans and their Egyptian driver and raised concerns about safety in Red Sea resorts. As part of the Ministry of Tourism's efforts to facilitate the revival of the tourism industry, all electric bills from touristic establishments have been postponed to 2015 while dropping any related fines. The ministry is also targeting new markets with high purchasing power, particularly India and China. Earlier this week, EgyptAir signed an agreement to launch a direct flightline between Cairo and New Delhi while adding three lines to the existing four lines between Egypt and India. Egypt is currently targeting one million tourists from India by 2017.